The entire event kicks off on Thursday, May 2nd from 6:00-8:00pm at the Mill Point Health Center! 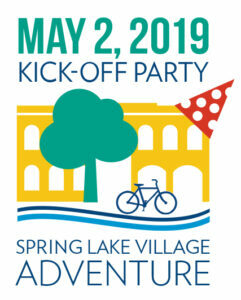 Spring is here and it’s time to celebrate, get outside, and ride, walk, or run over to the Village Adventure Kick-Off Party! Come out and dance your way out of winter hibernation with 90’s music from the band Project 90 – brought to you by the North Ottawa Community Hospital Laboratory and Eye Care One! There will be food, games, and prizes, as well as ambulance and Sheriff’s cruiser tours for the kids! They’ll also love the face painting and bike helmet giveaways! Thinking about swimsuit season? Try a Pilates Sampler with Generation Care, a Plank Challenge, or jump feet first into a Hula-Hoop contest! The Village has so many great trails and they lead right to the party so let’s get this one started! This year’s Village Adventure is brought to you by your DDA and Doug Heins State Farm Insurance and Eye Care One!